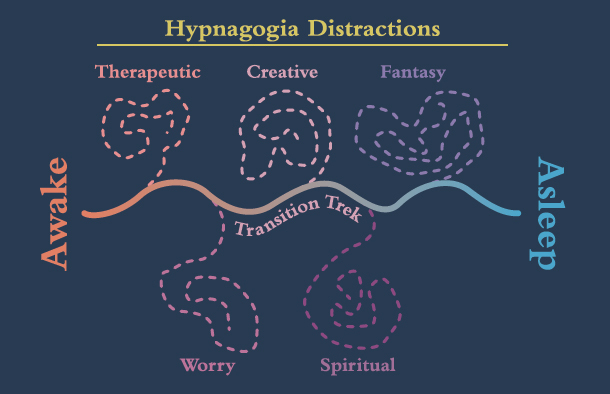 Hypnagogia is a maze with a multitude of distractions, negative and positive. You can easily lose your way to sleep, as we found out in the previous chapter. Instead of letting your mind freewheel and latch onto the process with the most emotional energy, you should take control of your mental processes and lead them through hypnagogia. To do that, we create a mental path, a trek as shown in Figure 3-1, to travel down while trying to go to sleep, and you don’t do this on the fly. You prepare well in advance and use the same procedure time and again. First of all, we know that images are the most powerful part of the hypnagogic process; therefore, instead of allowing hypnagogia to supply them, we will develop our own images that will direct our activity. Images and activity are the answer. That activity will be a non-eventful, often-used trail to hike through the mountains. Using this general idea, we will construct an imaginary path to follow. We will have a starting point and an end point. The starting point should be an imaginary place that signifies the end of the day, and the end point should signify a place to sleep. The emphasis here should be on “imaginary” places. The entire trek is imaginary. You are trying to divorce yourself from the real world and invest your imagination in something to divert your attention away from the unbridled hypnagogic experience. You are creating a trail, and one continuous action along it, that you will follow through the hypnagogic maze. You might think that using a setting you remember would be a good choice, but that would tie you to the real world and associations with the experience, and we want to use the imagination as much as possible. I will help you in that effort by providing words that will stimulate your imagination. The images and actions you then use will come solely from your imagination. If this is starting to sound like a lot of upfront work to prepare for sleep, don’t be alarmed. You only have to create this psychic trek once, and it is really easy. We’ll call it our Transition Trek. It will be defined in detail and provided for you in the next chapter. You will then use it every time you need it, whether it is for use at the beginning of a night’s sleep or later in the night as an attempt to return to sleep after waking. It can be the only path you ever create. It should be continuous, vivid but rather monotonous and flow through the mind effortlessly. After all, we are trying to get you to sleep, not write a novel. If this helps, it won’t be much, since it is little different from counting sheep. But it has one aspect that is profoundly unhelpful. In both examples mentioned in this quote, they involve the most important and emotionally laden real-world activity in which the person engages. The emotional content of the imagined activity may very well derail the search for sleep before it can get going good. An emotional activity connected to the real world is precisely what we are not looking for. We will get into the negative role played by the emotions in more detail toward the end of this chapter. When using the Transition Trek, above all else, you must concentrate on the images you create and the actions you perform within your imagination for each stage as you proceed. Remember, the Transition Trek is not intended to be interesting. It should be monotonous and uneventful, but soothing and pleasant. The first thing to do after you get into bed is to look around the room and realize where you are. Get a hold of yourself. Come out of internal priorities and external concerns and just be yourself. This is sort of a “Be Here Now” moment, not in the existential sense, but in an ordinary sense. Get a grip on yourself and relax. You are about to go to sleep. Realize that the only reason you are there is to go to sleep. Sleep professionals want you to spend a lot of time on this, perhaps even a week or so to fully develop methods of relaxation and mind clearing. I have found this helpful but not mandatory, depending of course on your specific mental situation. However, even if you are really messed up, this method I am recommending will help you the first night. Do your detailed centering exercises, if you have too, but I will be provocative and recommend that you skip them and instead start the Transition Trek. The most I recommend after getting into bed is to read a book for a few minutes, maybe as much as a half hour, and then turn off the light. Even before visualizing the starting point of your trek, you should establish a sleep-breathing rate. Granted, breathing is an autonomic function that we do not have to consciously monitor, but sleep breathing is different from that which occurs naturally while awake, and it starts during hypnagogia. It is not much different than normal breathing, just a little slower and heavier. While asleep, we inhale a little deeper and exhale more fully, possibly with a slight pause between breaths. We breathe about twenty times per minute, which is one-third to one-fourth of our heart rate. Many meditation techniques start with the practitioner focusing on breathing. It is the gateway to our internal psychic depths, and establishing a sleep-breathing rate can trigger the engagement of other more subtle sleep processes. Remember that you are in this for the long haul, and your knowledge of how your body and mind function will become apparent as you solve your sleep problem. Over time, I have found sleep breathing to be an extremely powerful beginning to the Transition Trek. As a matter of fact, a couple of decades ago, I used sleep breathing on its own as a method of enticing myself into sleep. Of course, this was long before I invented the Transition Trek. Once you have become accustomed to artificially inducing sleep breathing, it just might start happening upfront automatically when you decide to go to sleep. Not only that. Images of the trek will form more easily, be more vivid, and the entire process will have been strengthened. Establishing sleep breathing should not take more than ten or fifteen seconds. Another distracting factor is that when you close your eyes and try to drop off to sleep, you will at first become more highly attuned to your physical state. This is the first segment of hypnagogia. You’ll notice an itch that needs to be scratched, your nose will start to whistle when you breathe, an assortment of muscle pains will surface, and you will have some difficulty finding a proper body position. Your feet will be either too hot or too cold. Do not allow yourself the luxury of becoming annoyed with all this because that will only take you further from the psychic state you are trying to cultivate. These irritants are normal and have a natural solution. Realize that they are a positive sign that hypnagogia has already started. Cater to them for a short time, but gradually allow your concern over them to drop into the background and actions to control them diminish. This means that an element of sleep onset involves your mind disengaging from the external world by severing (to a certain extent) its links with your body’s five senses. It is quite obvious that we stop incoming light when we close our eyelids, and thus halt the incoming images from the external world, but quite a bit less obvious that our brain has mechanisms to reduce our awareness of the other body senses as well, i.e., taste, touch, sound and smell, when we go to sleep. Of course, this deafferentation is not total. Abnormal inputs from the external world can easily override it and wake us. An example would be the cry of a child. But if we didn’t have this deafferentation mechanism, we would never be able to get to sleep. And it happens more rapidly than you might think. One second you have so many things going on that you believe you will never get to sleep, and the next instant you know nothing about your body. Furthermore, we are not aware of this ability. This ignorance can cause us to try to make our bodies perfectly comfortable before we even try to go to sleep. When that isn’t possible, it can lead to irritation and escalate to anger. Nothing has to be perfect for us to go to sleep. Since this happens automatically, we don’t need to spend any pre-sleep time on this, so let’s move along. Just like the mind’s eye, the other four senses also have a mental, or psychic, counterpart. This is an amazing fact. During the Transition Trek, our solution to all this unwanted sensory input is to replace each of the five physical senses with equivalent psychic senses, such as the images and sounds involved in dreaming. See Figure 3-2 and Figure 3-3. 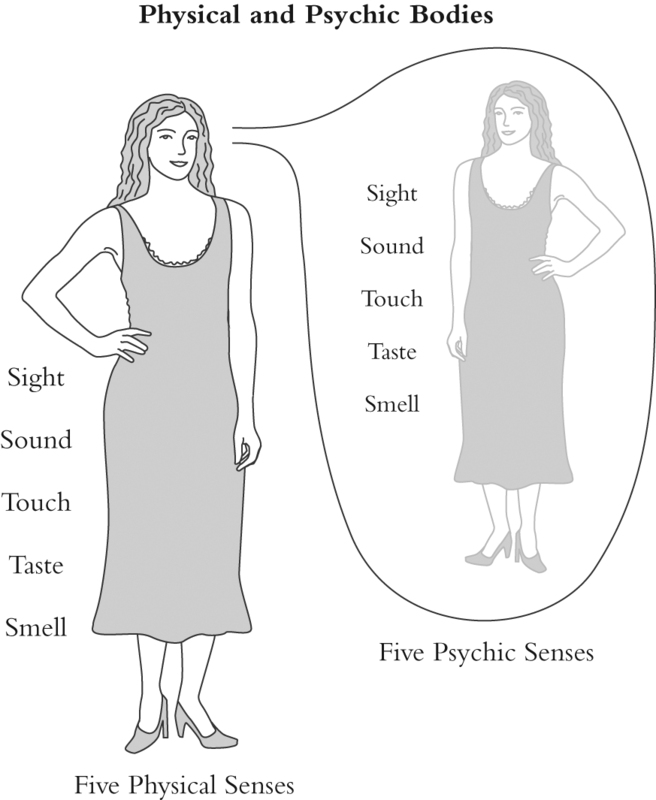 Transitioning awareness to psychic senses rather than actual real-world body senses is extremely important. Here is a list of what your body probably will be sensing just as you go to bed versus what you will be psychically sensing initially when you start the Transition Trek. Of course, all these psychic senses will change based on what you encounter as you progress along the trek. These psychic senses do already exist and you use them all the time, particularly while dreaming, so I’m not asking you to do anything you don’t already know how to do. We’ll get into the application of this in detail when we create our Transition Trek, but right now just realize that imagining one of the senses activates that psychic sense. All you have to do to situate yourself into your imaginary world is to imagine hearing an owl, imagine seeing the boat you are rowing, imagine feeling the oar in your hand, imagine smelling the pine trees, imagine tasting the salt water on your lips. You do this all the time when reading a novel, poem or short story. Authors evoke the psychic senses with descriptive words. The words trigger the reader’s imagination and activate the psychic senses, the same ones you use when dreaming. To further engage the imagination while on the Transition Trek, the reader performs an action, like walking in a forest. Again, this is just your initial education and requires no action on your part until we use the Transition Trek. Let’s keep moving. In addition to psychic senses, we have a psychic voice. We hear this voice as thoughts that run through our minds all the time. This voice is a lot like breathing in that it can work on automatic or we can take over the controls and direct it to say what we wish. It is not always so easy to shut off completely. But the amazing thing is that it can at times seem to be autonomous and say things that we never intended. When we are trying to go to sleep, this voice can be a real nuisance because it just will not shut up. We will also need to consciously take over the psychic voice and make it a part of the Transition Trek. Even with this problem of recognizing our physical presence in the world of the imagination solved, more problems, those that involve the emotions, can surface. The three emotions that can block your path most quickly are fear, worry and anger. I call them the Terrible Triad. Fear activates the “fight-or-flight” response, which produces physiological activity not conducive to sleep. You may not be ready to jump out of bed and run off into the dark, but a level of uneasiness about your dark bedroom or someone outside, actual or imagined, can stop cold your descent into sleep. I’ll speak more about worry in Chapter 9, but for now just realize that worrying drops you into the world of problem solving. The most profound element of worrying is that by doing so, you unconsciously believe that you are holding your world together and if you don’t worry, it will fall apart. But the worry world is nothing more than a distraction and a long ways from sleep. Anger has conflict at its root, and conflict is the basis of storytelling; just ask a novelist or screenwriter. Getting involved with anger can get you trapped within a storyline to resolve that conflict. It is hard to let go once you have activated your imagined antagonist (sibling, parent, partner, someone at work) and locked the conflict. Here is the big problem with the Terrible Triad. They have physiological components, and the body starts to, among other things, sweat, and increase muscle tension and body temperature. Adrenalin flows, and we experience unfavorable changes in heart rate and blood pressure. Yes, the effects can be and usually are subtle, but subtle is enough to waylay sleep. This is not a scenario with a happy ending. However, the imagined images and other four psychic senses involved in moving along the Transition Trek will go a long ways toward leading you away from fear, worry and anger. You should make the effort to become accepting, calm, patient. This deactivated emotional state will also allow the deafferentation process, mentioned earlier, to start much quicker. The good news is that we don’t have to do anything special to establish this. It is a good idea not to get into an argument just before bedtime, and don’t start doing your income tax, or grading papers if you are a teacher, just before bed either. Avoid engaging in activities that involve the emotional extremes, and it will be much easier to engage with the Transition Trek. Reading a boring story beforehand is a good idea. Universally, sleep experts tell you not to sit in front of your computer screen before sleep. They have researched this and say it contributes to insomnia. This is probably a good idea if you don’t know what you are doing when you try to go to sleep, but with the method I am going to show you, it shouldn’t be a problem. Sleep professionals will also encourage you to make your environment, your bedroom, as sleep friendly as possible. This means eliminating all sources of light, sound, and establishing the proper room temperature. It is okay to do this if you really don’t have much to do and want to get into this stuff. But here is the truth of the matter, and it involves deafferentation. Very dark room: not necessary. Ultra-quiet room: not necessary. Perfect room temperature: not necessary. Etc. With all this knowledge about the pre-sleep state, I will now show you how to find your way through hypnagogic distractions, and it is much easier than you might think, based on all the problems and solutions I have identified. So crawl between the sheets, and let’s go to sleep.